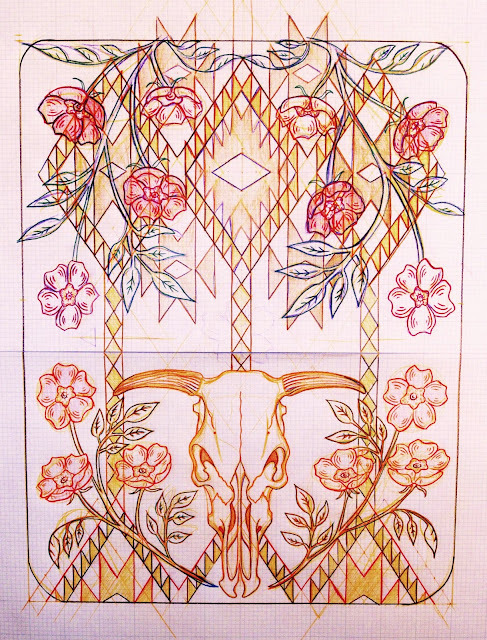 We started the design process with the themes: cow skulls, roses, wolves and navajo designs. Wolves were weeded out quickly since they didn't really fit into the desert-esque feel of all the other components. 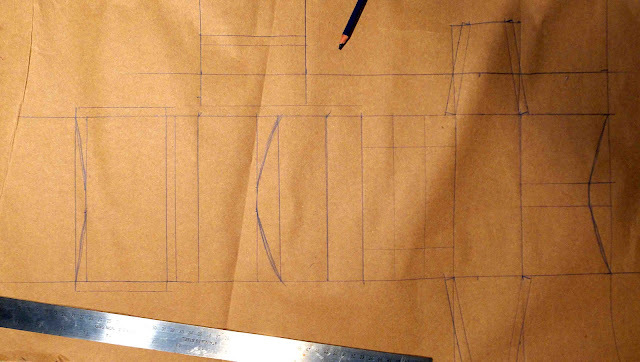 Above is the initial concept sketch. At the time this was done we were going to go with the Master hobo shape which later changed to a new shape altogether. The change of shape made for a more elongated canvas. 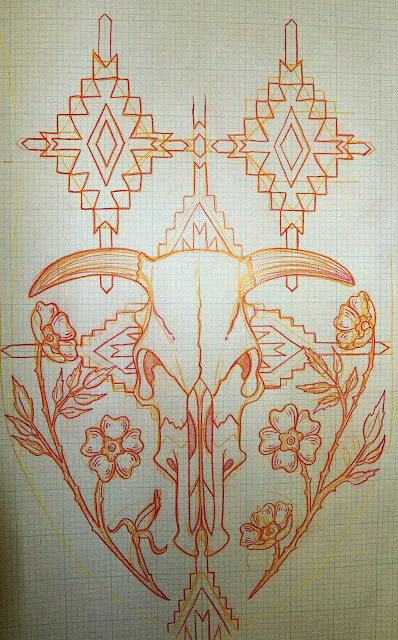 Here we have the navajo design more integrated with the skull and roses. The front of the bag will be the skull with the diamonds and roses on the back. 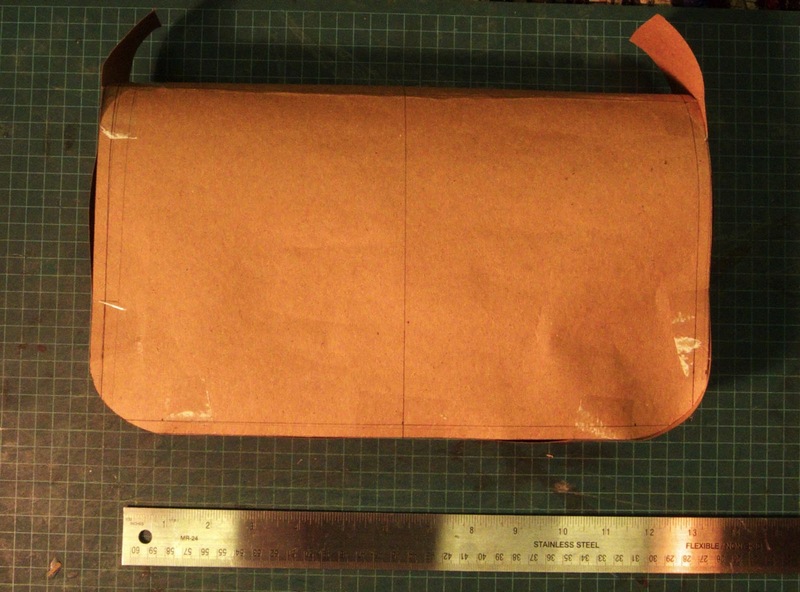 This diagram shows the imagery that will be under the flap of the bag. Ayla wanted to have a heart shape somewhere in the bag as she uses it a lot in her own design work. 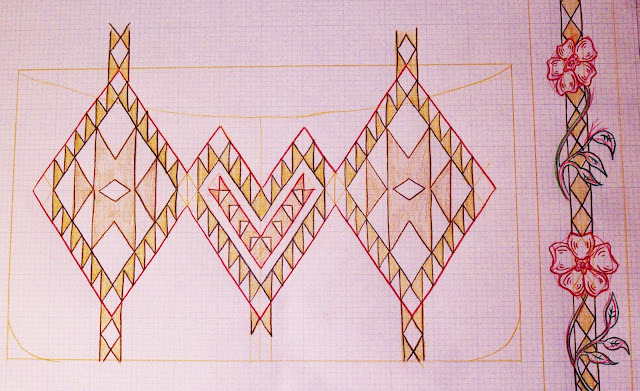 I decided to incorporate that within our imagery by taking cues from the navajo 2 x 3 diamond shapes and putting it within that motif. I also choose to have this area with just the navajo designs so they aren't always treated as a backdrop. 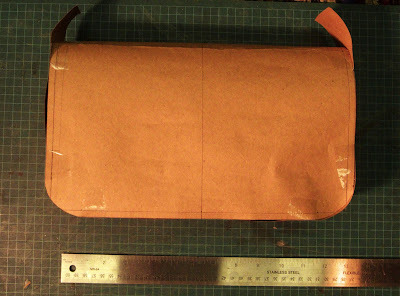 On the right side is the plan for the bottom and sides of the bag. It has the basic diamonds from the navajo design with roses vining around. 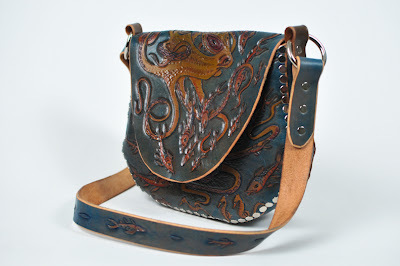 The detachable strap of the bag will most likely have just basic navajo designs as it will be quite thin. 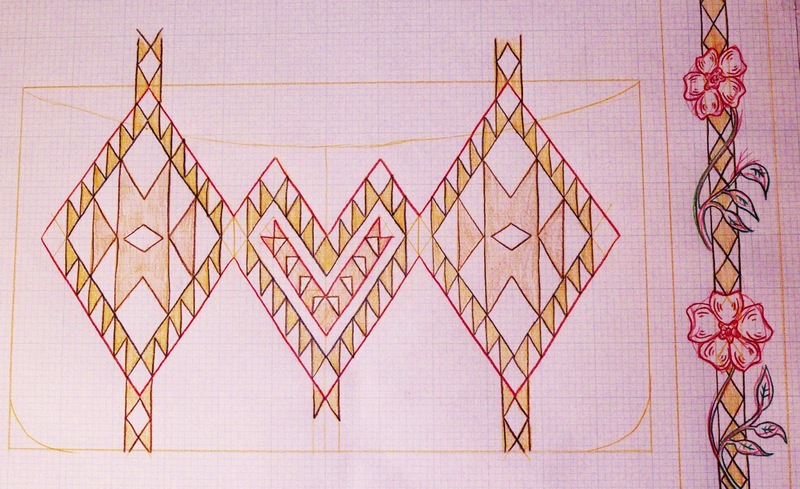 This is the pattern for the bag 12" x 7" x 2". Ayla needed a smaller bag but has a larger wallet so we needed to design a new shape for her. This shape is nice from my point of view because there is a lot of surface area to fill with illustrations. 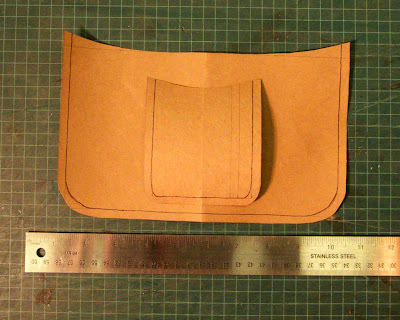 The bag patterns are always a bit larger than the finished product because I put an extra 1/4" all around to account for where the rivets will go. 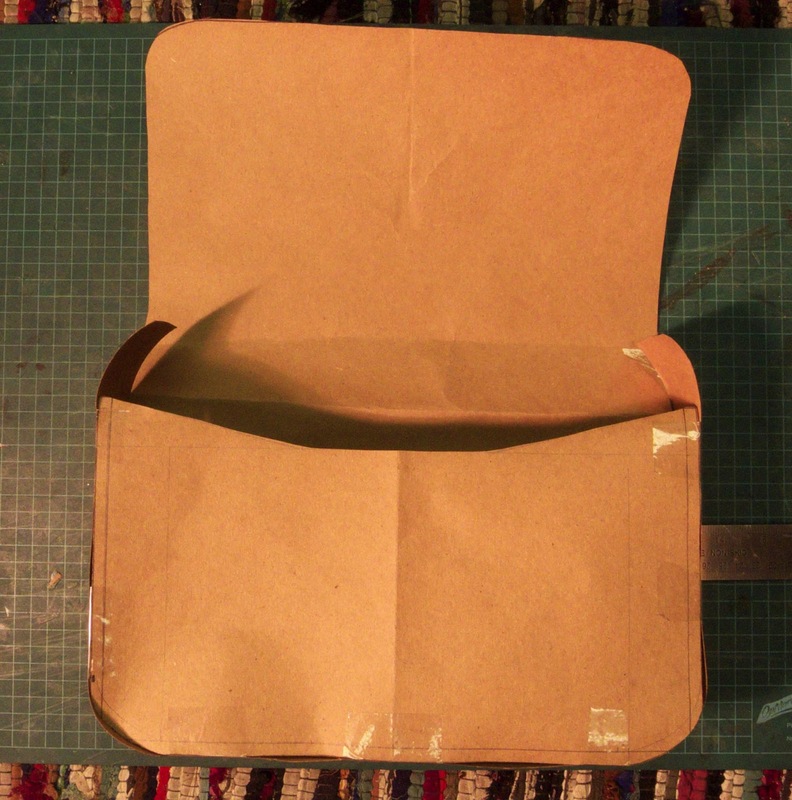 This is an envelope clutch design so the front goes all the way down and will close with magnetic snaps so the closure doesn't take away from design (illustrative) space. Inside pockets: one for miscellaneous things and the little one for a cellphone. I think this will be a beautiful bag because it has a structured geometry with wilder elements playing within it, perfect decorative motif. Whenever I do work like this I am reminded of my hero William Morris' tapestries, gorgeous.